These meditation quotes are all positive, inspirational words of wisdom about meditation. Meditation is one of those words that has a alternative meaning to different people, especially if it is taught as part of someones religion. The dictionary definition is to reflect deeply, especially on spiritual matters; think about or plan. So meditation can vary from simply being immersed in a thought, to the profound esoteric meditation that takes years of diligent practice. The one thing they all have in common is the engrossed intent on keeping the mind occupied on One thing, or No-thing...to still the habitual thoughts that we constantly produce. These meditation quotes cover many people from varied walks of life stating what meditation means to them. Meditation quotes are alphabetical on authors surname. Unknown author meditation quotes are at the bottom of the page. Jesus brooded upon the Divine imminence until at last he could declare... "I and my Father are One." The whole thing about meditation and yoga is about connecting to the higher part of yourself, and then seeing that every living thing is connected in some way. The centre that I cannot find is known to my unconscious mind. Look well into thyself, there is a source of strength which will always spring up if thou wilt always look there. Nowhere can man find a quieter or more untroubled retreat than his own Soul. Silence is the sleep that nourishes wisdom. Information like fruit is already free, if you pluck it directly from the tree. Sometimes you have to close your eyes to see clearly. Meditate. Live purely. Be quiet. Do your work with mastery. Like the moon, come out from behind the clouds.. Shine. When you go into the space of nothingness, everything becomes known. There is nothing so unthinkable as thought, unless it be the entire absence of thought. In solitude... where we are least alone. 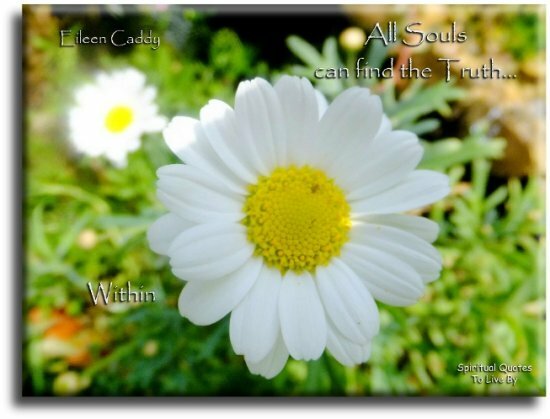 All Souls can find the truth within. Be still and you will know the truth and the truth shall set you free. 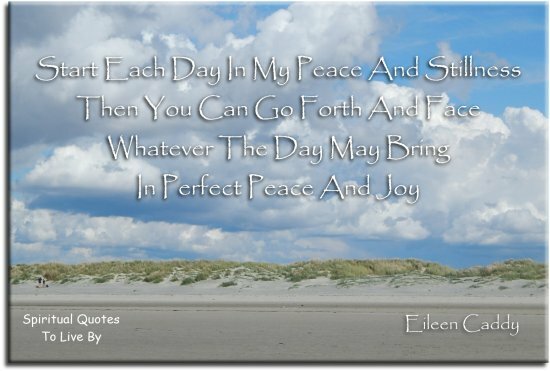 Start each day in my peace and stillness, then you can go forth and face whatever the day may bring in perfect peace and joy. History shows that the majority of people that have done anything great have passed their youth in seclusion. Silence is as deep as eternity. Silence is more eloquent than words. 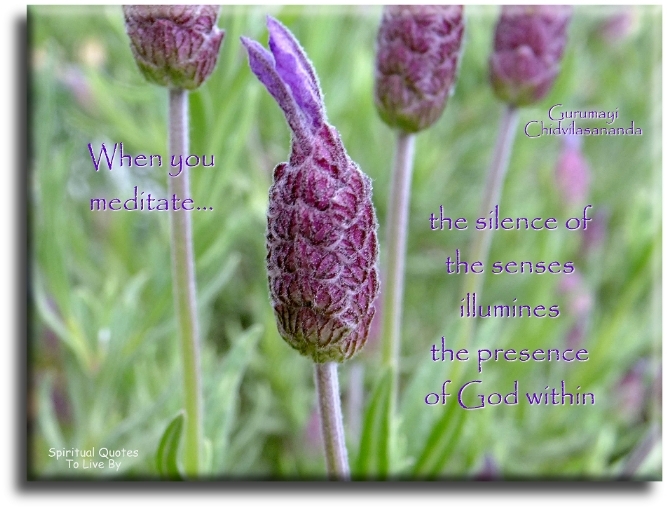 When you meditate, the silence of the senses illumines the presence of God within. If we know the divine art of concentration, if we know the divine art of meditation, if we know the divine art of contemplation... easily and consciously we can unite the inner world and the outer world. Silence is the great teacher and to learn its lessons you must pay attention to it. There is no substitute for the creative inspiration, knowledge, and stability that come from knowing how to contact your core of inner silence. The space between your thoughts is the window to the cosmic mind. Watching birds has become part of my daily meditation, affirming my connection to the Earth body. If you want to find God, hang out in the space between your thoughts. The quieter you become... the more you hear. If we can just quiet ourselves down, we can hear the whispers of God. Knitting is very conducive to thought. It is nice to knit a while, put down the needles, write a while, then take up the sock again. Golf is a search for perfection, for balance. It's about meditation and concentration. Our outer world will always be a reflection of our inner world. 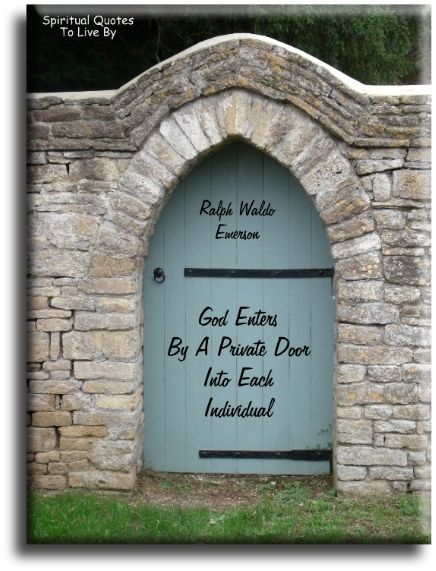 God enters by a private door into each individual. 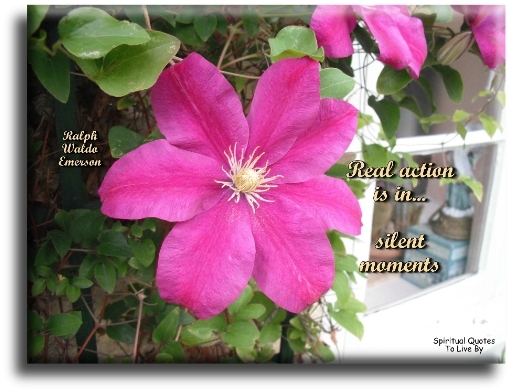 Real action is in silent moments. Meditation is the Soul's perspective glass. The focus and the concentration and the attention to detail that flying takes is a kind of meditation. I find it restful and engaging, and other things slip away. Learning how to be still, to really be still and let life happen - that stillness becomes radiance. Let your mind start a journey through a strange new world. Leave all thoughts of the world you knew before. Let your Soul take you where you long to be. Close your eyes, let your spirit soar and you'll live as you've never lived before. than what we normally take to be reality. 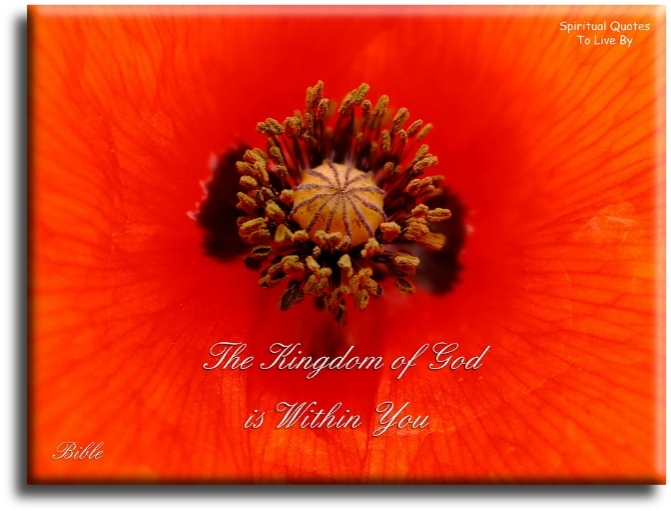 In order to find the God without, we need to find the God within. Meditation is not passive sitting in silence. It is sitting in awareness, free from distraction and realizing the clear understanding that arises from concentration. Walk so that your footprints bear only the marks of peaceful joy and complete freedom. To do this you have to learn to let go. Let go of your sorrows, let go of your worries. That is the secret of walking meditation. When you walk across the fields with your mind pure and whole, then from all the stones and all growing things, and all animals, the sparks of their Soul come out and cling to you, and then they are purified and become a Holy fire in you. salute thyself, see what thy Soul doth wear. The best reflections are there when the wind, water and you are still. 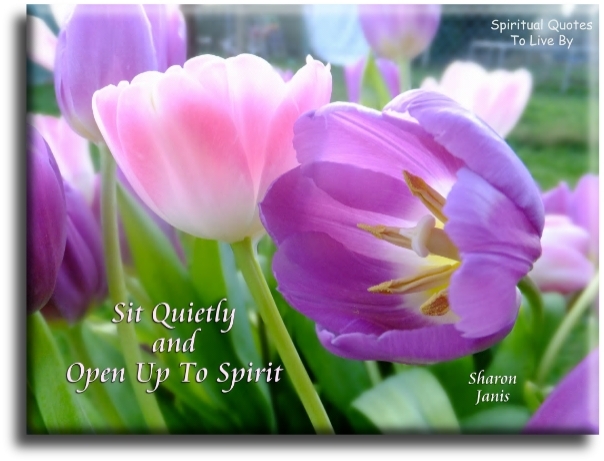 Sit quietly and open up to spirit. Listen to the silence... it has much to say. Whatever the method, the purpose of quieting the mind is always the same... to step out of you own way and touch a Universal Oneness with all things. It is only when we are silent to the blaring sounds of our daily existence that we can finally hear the whispers of truth that life reveals to us, as it stands knocking on the doorstep of our hearts. If you want the truth, I’ll tell you the truth.. Listen to the secret sound, the real sound, which is inside you. Music without words means leaving behind the mind. And leaving behind the mind is meditation. And the source of all is sound. Be quite still and solitary. The world will freely offer itself to you to be unmasked. It has no choice. It will roll in ecstasy at your feet. You do not need to leave your room. Remain sitting at your table and listen. Don't even listen, simply wait. Do not even wait, be quite still and solitary. The world will freely offer itself to you to be unmasked, it has no choice, it will roll in ecstasy at your feet. I like to pray and I like to meditate. Doing just three minutes of prayer and a minimum of five minutes meditation twice a day sets the tone - like an arrow so that you’re hitting your target. Meditation is not the pursuit of an invisible path leading to some imaginal bliss. The meditative mind is seeing, watching, listening, without the word, without comment, without opinion, attentive to the movement of life in all its relationships throughout the day. To understand the immeasurable, the mind must be extraordinarily quiet, still. When the mind is relaxed, no longer making an effort, when it is quiet for just a few seconds, then the problem reveals itself and it is solved. That happens when the mind is still, in the interval between two thoughts, between two responses. In that state of mind, understanding comes. Learn to get in touch with the silence within yourself and know that everything in this life has a purpose, there are no mistakes, no coincidences, all events are blessings, given to us to learn from. There is no need to go to India or anywhere else to find peace. You will find that deep place of silence right in your room, your garden or even your bathtub. Solitude is the audience chamber of God. The man who sat on the ground in his tipi meditating on life and its meaning, accepting the kinship of all creatures and acknowledging unity with the universe of things, was infusing into his being the true essence of civilization. and the whole world will be full of supreme spirit. When I loved myself enough... I came to love being alone surrounded by silence, awed by its spell, listening to inner space. A man should keep for himself a little back shop, all his own, quite unadulterated, in which he establishes his true freedom and chief place of seclusion and solitude. Sometimes I sits and thinks, and sometimes I just sits..
Old age is the time of meditation, of conclusion and wisdom, of story-telling and sharing advice with the little ones and youth as one climbs the last hill of life. There is often a great strength in stillness: a fallow land recuperates its energy. As fragrance abides in the flower. As the reflection is within the mirror. So doth thy Lord abide within thee. Why search for Him without? And to remember the peace that may be found in silence. Listen to the wind... It talks. Listen to the Silence... It Speaks. 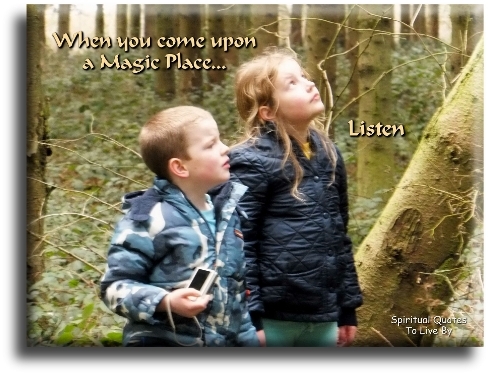 Listen to your heart... It Knows. 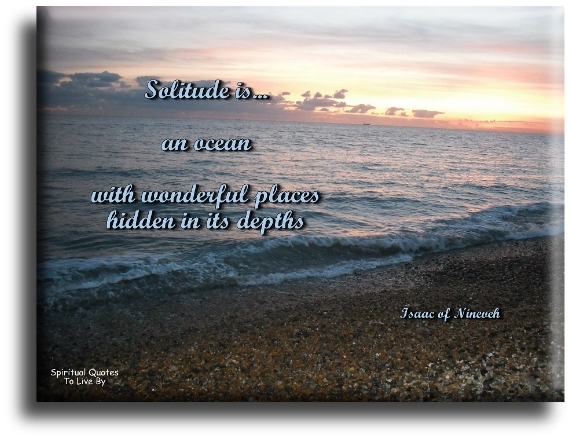 Solitude is an ocean with wonderful places hidden in its depths. Within each of us there is a silence, a silence as vast as the universe. And when we experience that silence, we remember who we are. You can know the Higher Will by listening within. Nature - trees, flowers, grass - grow in silence. We need silence to be able to touch Souls. Learn to be silent. Let your quiet mind listen and absorb. Find ecstasy within yourself. It is not out there. It is in your innermost flowering. The one you are looking for is you. To be alone and to be drunk with your own aloneness is what meditation is all about. Be in the world, but don't be of it. Your life sparks fires from within your innermost temple. No one can reach there but you, it is your inner sanctum. You are your own master there, only you can reach and ignite the fire. Go into yourself and see how deep the place is from which your life flows. Never less alone than when alone. 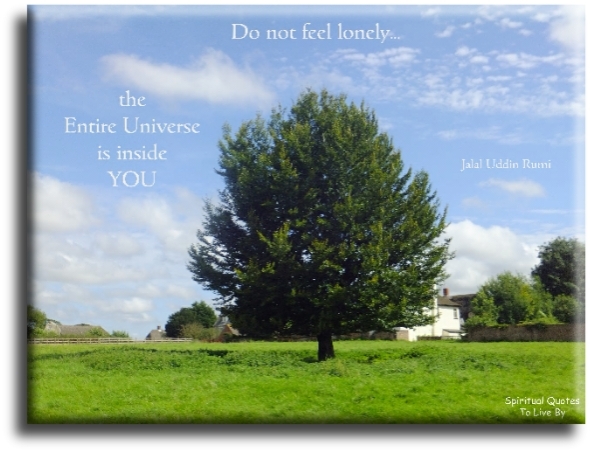 Do not feel lonely... The entire Universe is inside You. Let go of your mind and then be mindful. Close your ears and listen. Put your thoughts to sleep, do not let them cast a shadow over the moon of your heart. Let go of thinking. There is a voice that doesn't use words... Listen. The Soul has been given its own ears to hear things that the mind does not understand. 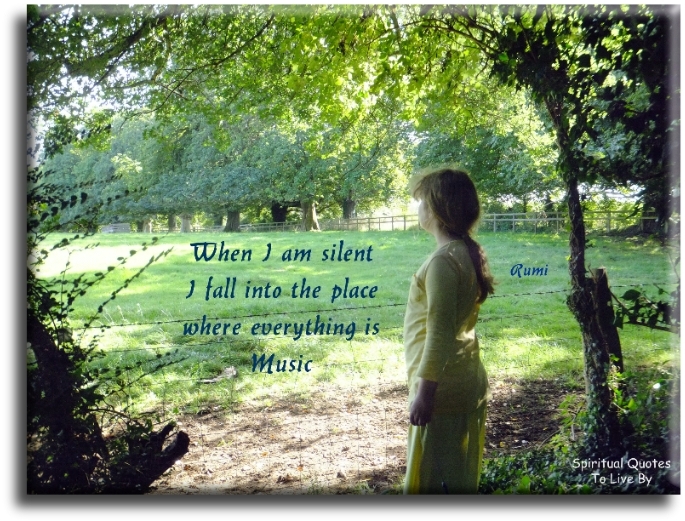 When I am silent, I fall into the place where everything is music. Why are you knocking at every door? Go, knock at the door of your own heart. Your heart is the size of an ocean. Go find yourself in its hidden depths. Curb your senses and your mind and see the Lord within your heart. Meditation is painful in the beginning, but it bestows immortal bliss and supreme joy in the end. Practice meditation regularly. Meditation leads to eternal bliss. Therefore meditate, meditate. Yoga introduced me to a style of meditation. The only meditation I would have done before would be in the writing of songs. In a garden you can find, quiet thoughts that calm the mind. Meditation is not something that should be done in a particular position at a particular time. It is an awareness and an attitude that must persist throughout the day. Without stirring abroad, one can know the whole world. Without looking out the window, one can see the way of Heaven. Meditation is the tongue of the Soul and the language of the Spirit. In the silence of the heart, God speaks. We need to find God, and He cannot be found in noise and restlessness. God is the friend of silence. See how nature - trees, flowers, grass - grows in silence. See the stars, the moon and the sun, how they move in silence. We need silence to be able to touch Souls. He enjoys true leisure who has time to improve his Soul’s estate. I never found a companion that was so companionable as solitude. Silence is the communing of a conscious Soul with itself. Awareness without projection is the greatest meditation. I believe that painting should come through the avenues of meditation, rather than the canals of action. If your mind is still... You can sense the peace that emanates from the Earth. To meet everything and everyone through stillness instead of mental noise is the greatest gift you can offer the Universe. Sometimes its in the quiet that we hear the loudest things. 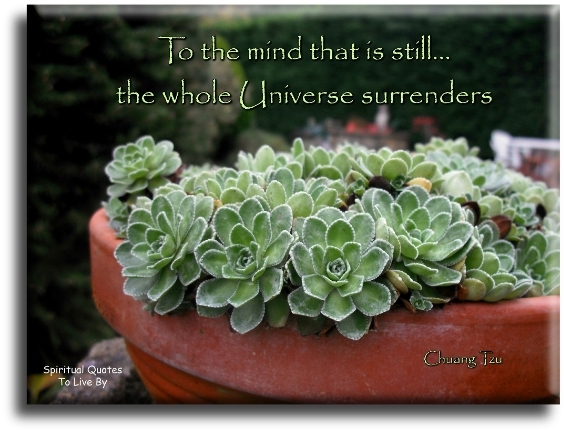 To a mind that is still... the whole Universe surrenders. At the centre of your Being you have the answer.. You know who you are and you know what you want. Be still.. Stillness reveals the secrets of eternity. 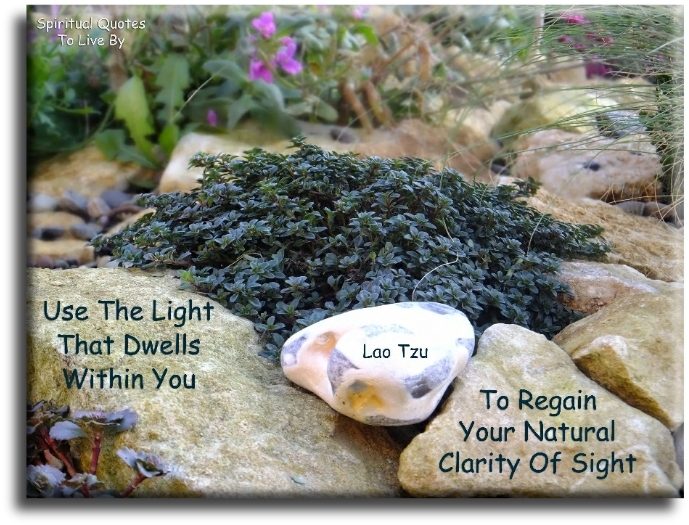 Use the Light that dwells within you to regain your natural clarity of sight. Regardless of the situation at hand, the answer is always found through your inner peace. Meditation is the dissolution of thoughts in eternal awareness or pure consciousness, without objectification, knowing without thinking, merging finitude in infinity. Meditation is the discovery that the point of life is always arrived at in the immediate moment. You don’t look out there for God, something in the sky.. You look in you. You will begin to realise that if you contemplate long enough on the leaf of the flower, that it involves the whole Universe. If we go down into ourselves, we find that we possess exactly what we desire. I deepen my experience of God through prayer, meditation and forgiveness. Come into the silence of solitude and the vibration there will talk to you, through the voice of God. One need not scale the heights of the Heavens, nor travel along the highways of the world to find Ahura Mazda. With purity of mind and Holiness of heart one can find Him in one's own heart. Cultivate inner calm, daily linking yourself to God in prayer and meditation. Always giving light from your spirit - never depression - only light, and walking patiently and humbly on your path. You will then be recipients of the unfailing power of God and reflections of Divine love. Meditate... Because some questions can't be answered by Google! Peace is the vibrant space which stimulates the dance of kindness, merriment and freedom. Silence gives rest to the mind and this means giving rest to the body. Sometimes rest is the only medicine needed. When you come upon a magic place... Listen.